Some people have dry brittle toenails by default and they need TLC all year round but the winter is the perfect time to get a good seven or eight months of treatments in. Remove all old nail polish/varnish. 1. Once a week set a little time aside and fill a basin with look warm water with a handful of table or Himalayan salt and soak your feet for ten minutes. 2. Using a soft toothbrush and a squirt of your favourite shower gel gently brush around the four edges of your nails. 3. Dry your feet with a soft towel and prick a hole in a Vitamin E capsule (available in chemists). Massage a drop of Vitamin E into each nail. The molecules in Vitamin E are small enough to be absorbed into the nail. 4. Pop on a pair of fluffy socks. 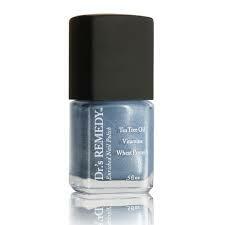 For extra nourishment the next day paint on a coat of Dr’s Remedy Hydration Nail Moisture Treatment or similar. Pop an alarm in your phone to do it all again next week and watch the new nourished nail grow.